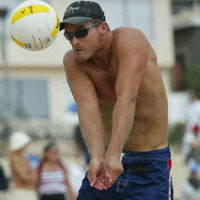 Davenport and Collin Smith tied for seventh in the inaugural beach volleyball competition at the 1999 Pan American Games in Winnipeg, Canada. A 1989 graduate of Greece Olympia High School in Rochester, Davenport started playing beach volleyball in 1992. His hobbies are golf, basketball and tennis. He is currently the women's volleyball head coach at Cal State Dominguez Hills.